The Asia Theological Association (ATA) recently held its annual theological consultation in Manila. On the first night of the event, APNTS Professor of Old Testament Dr. Mitchel Modine unveiled his recently published commentary on the Book of Numbers. The book is part of a series called Asia Bible Commentary, which aims to be a pastoral, practical resource for Asian ministry leaders. 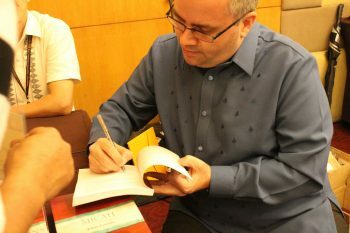 Though most of the writers are Asian scholars, the series editor said Dr. Modine was chosen because of his long experience in Asia, and especially because he has married a Filipina and intentionally inserted himself into the culture. Dr. Modine gave a short speech about his experience writing the commentary, then signed copies of the book for several of the attendees. This is Dr. Modine’s fourth book. His previous books dealt with the books of Jeremiah and 1–2 Chronicles.